While I wrote Naked: A Novel of Lady Godiva I kept a postcard of the Statue of Liberty in the drawer of my bedside table. Telling Godiva’s story took many years and if I ever lost heart, Lady Liberty would always spur me on. You can imagine my joy at NAKED being published by St Martin’s Press in New York and the official release day being 14 July 2015. 14 July is Bastille Day, commemorating the beginning of the French Revolution. 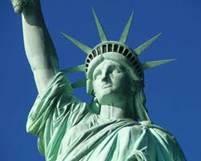 It was, of course, the French people who gave the beautiful statue to the people of New York to celebrate American Independence. 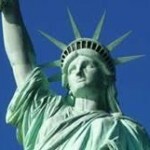 As a symbol of sovereignty, Lady Liberty continues to inspire me. I’ve always been passionate about the American dream and I’m so grateful to be sharing it too. NAKED: A Novel of Lady Godiva can be found at all good bookstores and online. May Lady Godiva inspire you to a life of love and freedom.